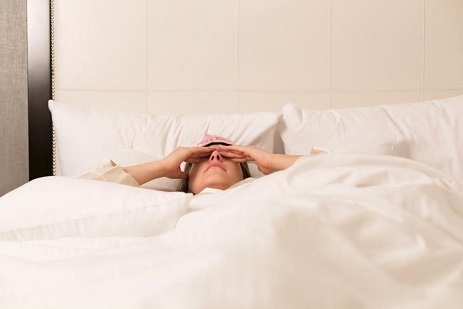 According to research, sleeping with a snorer costs you, on average, an hour’s sleep a night. Australians are the world’s longest sleepers with 73% of us having more than eight hours per night, compared with just 49% globally. Try encouraging your partner to sleep on their side or stomach rather than flat on their back as this position can cause the flesh of the throat to relax and block the airways. Another crafty method is to place a tennis ball on the back of their shirt to make it uncomfortable if he or she sleeps on their back. For those who need to sleep on their back, particularly if your snorer is suffering with nasal congestion, propping their head up higher with the use of an additional pillow can help reduce their snoring. Essential oils like lavender have calming properties which can help relax the mind and body to help you both ease into a natural sleep. Try this in conjunction with some of the behavioural changes for your partner to ensure you drift off before the snoring really takes hold. Lying awake next to loud and frequent snoring will undoubtedly leave you more irritated, but it can cause interrupted sleep for the snorer too. Earplugs for both partners can help reduce the intrusiveness of snoring into your zen and are widely available online, in your local drugstore, and from your doctor. These are inexpensive, soft and reduce the overall noise level. Don’t like the feeling of stuffing something in your ears on a nightly basis? Placing a standing fan near your beloved snorer can help absorb and diffuse the sound. This is most effective when they face the fan itself, but even when they don’t, fans and other constant or repetitive sound can help you doze off. Mattress springs can compress over time, which means your spine will gradually get less support. When your body gets less support during sleep, this can put pressure on your joints, which inherently means you move around more during the night. You’re the most rested when you spend long periods of time in the deepest stage of sleep (NREM3), and constant tossing and turning prevents you from sustaining this kind of sleep. Tempur mattresses have a unique TEMPUR material, which conforms to the weight distribution and warmth of your body to offer pressure relief and personalized support where you need it the most. Choosing the right pillow is important to help maintain anatomically correct sleeping posture, which is key to a healthy body and a good night’s rest. A pillow that forces your head up too high or allows it to fall back too far can hinder your breathing and in turn encourage snoring. Ergonomic pillows are perfect for those who require the best neck support possible to relieve discomfort for head, neck and shoulders. Tempur’s extensive range of ergonomic pillows are made for a variety of different sleepers including stomach, side and back sleepers. Nasal strips can be an unobtrusive addition to your partner’s sleep routine, but will only assist those whose snoring is caused at a nasal level, rather than in the throat. For throaty snorers, mouth guards are a popular and effective solution. Similar conceptually to a mouth guard often worn in sports, these contraptions simply adjust the wearer’s tongue location enough to ensure continuous airflow can be maintained throughout sleep. Several sites review different designs and options for these solutions, and buying online is usually a cheaper option, but research should be undertaken before deciding on the solution most suitable for your snorer. In extreme cases, it may be worth considering a CPAP mask. These are respiratory masks designed specifically to deal with sleep apnea. It works by blowing air under low pressure into the throat, which in turn keeps the airway open and prevents that choking sound. There are a wide variety of options available so it’s worth doing your research before investing. Over the counter medications can help reduce your sensitivity to noise disturbances. Consult your doctor about options available over the counter or on prescription to help aid your overall quality of sleep.